People don’t like to use harsh words. In polite company one certainly does not say a woman killed her unborn baby; one does not even say, “she had an abortion.” People are most likely to say “she terminated the pregnancy,” or “took care of the problem.” In war we do not like to say a lot of civilians got killed, we say “there was collateral damage.” We even say we put the family dog to sleep. It is so much easier to put harsh reality into pleasant terms, but we all know what we really mean. Louella is my wife and has been suffering from dementia since at least 2004 when she was mistakenly diagnosed with Alzheimer’s, but has probably had dementia since 2001. Louella went into St. Thomas hospital recently on a Thursday. The only reason we put her in the hospital is that her new primary care doctor said he did not prescribe psychotropic drugs and we needed to have Louella seen by a doctor who could. I don’t know if her doctor could not prescribe the drugs she needed or was not comfortable doing so, but in any event, he would not. Louella had been experiencing periods of absolute rage. She would fuss at the top of her voice for up to two hours at a time, with her face red. There was no placating her, no comforting her, or calming her. Finally exhausted, she would calm down. When not in the full-on rage mode, she was agitated and unhappy most of the time. She had also had some sleepless and restless nights. This had been going on for about six weeks. After our GP told us he would not renew her medicine, which had been prescribed by another doctor, we began trying to get her an appointment with a psychiatrist. (The “us” and “we” are Sue, her caregiver for the last five and half years, and me.) We tried without success to get her an appointment. Some psychiatrists were cash-only, some did not accept Medicare, and some would see her but an appointment was six weeks to two months away. Her medicine was about to run out. The office of her doctor suggested we take her to Parthenon Pavilion but that is where we took her in August of 2014 where, when she was supposed to be on one-on-one supervision, they allowed her to fall and break her ankle in four places and she never walked again. I was not comfortable taking her back to Parthenon. We were running out of options when her doctor’s office called and said St. Thomas had a Psyche unit and they had an opening and his office told us we needed to take her to the St. Thomas emergency room. We did and they discovered Louella had a severe urinary tract infection and she was hospitalized for that and by the time she was mostly cured of the UTI, the bed in “Behavioral Health” was taken so we had to wait another day or two before a bed in Behavioral Health opened up. We took Louella to the emergency on a Thursday and sometime early the next week she was moved to Behavioral Health. During the end of the week in which she went to the hospital and all of the following week, Sue stayed with her during the day and I would come in the evening after work and stay with her. Sue was gone on a well-deserved vacation the second week of Louella’s stay and the weekends that bracket that week and the following Monday of the next week. On Thursday of that week, the social worker pulled me into an office and went over several issues related to Louella’s release and future plans for Louella’s care. One of her items of discussion was what would I think, or would I agree to putting Louella back under hospice care. I said, “No, I would not.” She said, “Well, you know she is dying.” I said, “She is not dying right now and while I know she could die at any time; she could have a stroke or a seizure that killed her, it is not like she has a terminal illness with only days to live.” I said, “Under hospice care, she could die from a urinary tract infection. I don’t want that.” Then she said, “She has no quality of life.” I didn’t say anything else and we moved on to the next topic on her list. I know it is true that Louella is dying, just as we are all dying from the moment we are born. Louella could die tonight from a stroke or a seizure but I could die from a heart attack or an auto accident. While she cannot get well, she does not have a killer disease with only days or weeks to live. Her dementia could reach the point to where she cannot swallow or there could be other symptoms that end her life, but we are not experiencing those symptoms now. If “no quality of life” is the standard, well we should kill all babies who are colicky or are cutting teeth. We should kill all children born with severe mental disability. We should kill all prisoners. We should kill people who just went through a divorce, lost custody of their child, and lost their job and have a car that constantly break down. Anyway, it is not true that Louella has “no quality of life.” For about the six weeks prior to going to the emergency room during her awake hours she was agitated a lot and had those periods of real rage. That extreme rage may have been due to having a urinary tract infection. She cannot tell you what is wrong. She may have been in pain. For about a month prior to the period of the extreme agitation, Louella was a delight and joy. Louella is “total care,” and cannot talk, but during the month period prior to the weeks of agitation she was engaged. She laughed, she smiled and she was sweet. She noticed things and made eye contact. Her mumbling of nonsense syllables had words mixed in and she was not just chanting syllable; if you did not know, you would have thought she was speaking a foreign language. She spoke with inflection and punctuation, and she said some complete sentences and phrases. She enjoyed “talking” to people. She was happy. She had “quality of life.” I hope those times can return. Even when having periods of agitation, she enjoys eating. She will stop fussing to eat. Since she has difficulty swallowing, we have to feed her very slowly and it takes about and hour to feed her. She is happy when she eats. At night before bedtime, I always feed her ice cream and she loves ice cream and makes appreciative “uhumm” sounds as she eats. She at times enjoys watching the squirrels and birds at the bird feeder outside our front window. She loves Sue’s little dog, Beauty. She notices the dog. Louella can propel herself in her wheelchair, and she will try to go to the dog and will say, “Come her, you.” When she came home from the hospital, she was happy to see Beauty. Sue held Beauty up to Louella and Louella kissed her. Louella's mind may be gone for the most part, but she still has worth and she still has personality. Even when she is mad, she is sometimes cute. She will fuss in non-sense syllables and and then emphatically say, "And, I don't like it!" She also has a since of humor. She will rapidly babble a series of syllables, "bing, bing, bing, bing, binb, bing, bing, bing, bing, kaboom!" She will then rare back proudly and then have a mischievous smile on her face and then laugh and we laugh with her. She has a couple variation on this. The social worker only saw her in the hospital when she was sick. How dare her suggest Louella's life is not worth living! Louella was under hospice care from March 13th 2015 until December 5th 2015. She was put on hospice because while in the hospital with pneumonia she failed three swallow tests on three consecutive days. 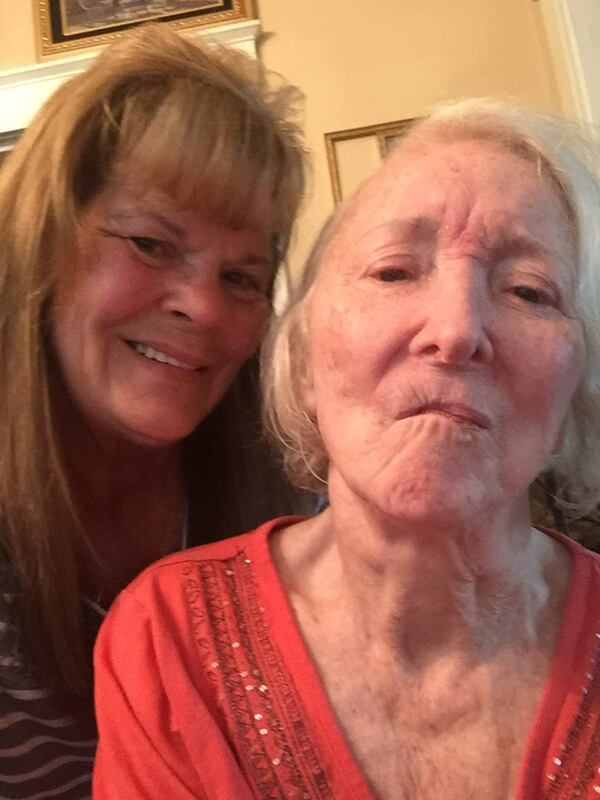 A palliative counselor told me, Sue, and my sister Kathleen, that the choice was to put a feeding tube down her throat or send her home with hospice care to die. I opted for hospice care. They said she had days or weeks to live and that she would die of starvation if something else did not kill her first. At first we gave her just thickened liquid like water or juice but we then started giving Ensure and chicken broth and other liquids with nutrition and she got stronger. 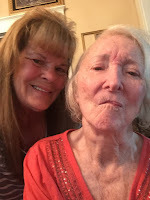 After a couple weeks we started giving soups and pureed food such as mashed potatoes or pureed veggies and she kept getting stronger, then we moved to soft but solid foods such as hamburger or shredded chicken and then to regular solid foods. On December 15th 2015 she was dismissed from hospice care. I know hospice care has been a blessing and comfort to many people. My father who died about 26 years ago was under hospice care for a few days before he died. I am not against hospice care, but the goal of hospice is to keep the patient comfortable as they die, not to help them get well. While Louella was under hospice care, they did not even take her temperature telling me they just did not do that, that a fever was just part of the process of dying and could be a comfort to a dying person. My anger has been directed at the particular social worker who tried to talk me into putting Louella under hospice care and "letting her go," but after reflection, she is probably just a cog in the wheel. The problem is most likely systemic and part of a societal disregard for human life, a disrespect for the elderly, and a dysfunctional healthcare system in which the patient does not come first. Rodney, this is so powerful. I feel for you brother. Hug Louella for me. Love, Donnie.